So yeah, Halo needs no introduction if you are a fan of role-playing games (RPG) or any other shooter games. The game mechanics and the strength of the story are the main backbones of this franchise. 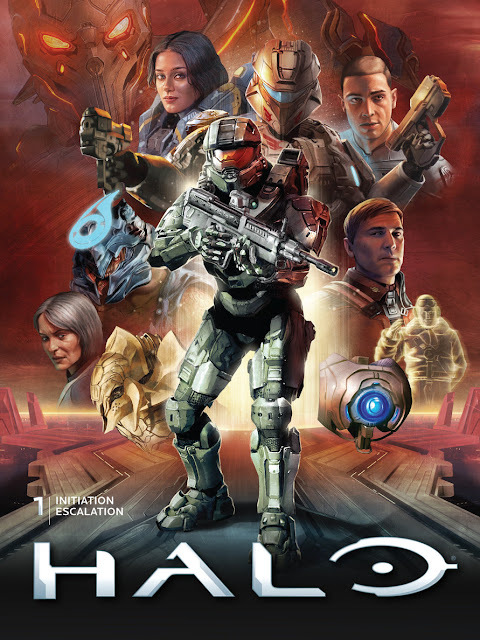 Halo is a masterpiece of a story and I was thrilled for the opportunity to read one of the recent instalments of the comic book - Halo: The Escalation Library Edition, which contains Halo: Initiation #1 - #3 and Halo: Escalation #1 - #12. These volumes, if I am correct, expand mostly on the state of the Halo universe events that occurred shortly before and after Halo 4 (the game). Also, it seems some of the volumes (Initiation, especially) go way back before the events of Halo 4. In one of the Initiation volumes, we get to see how UNSC get to pick Spartans and the process they go through to become one. The writers show us how Sarah Palmer becomes a Spartan and the enhancements made to her body. There is also a story about Ilsa Zane, a rogue UNSC Spartan who hijacks Infinity. Spartan Zane is unique in the sense that she fights without armour and her strength equals a modern Spartan wearing a full armour. Needless to say, the hijack attempt is foiled and we are given a little insight into what is wrong the Ilsa Zane project and how she went rogue. Another volume showcases the peace meeting between the brutes and the Arbiter (remember him?) and how that descends into chaos because a Spartan informant named Vladimir Scruggs betrays the location. The writers also put in some annotations in the volumes, which comprises of their thoughts on some of the processes they went through when penning the stories and drawing the art. They reminisce on the meetings they had and their ideas on individual characters, which altogether makes this collection a refreshing experience. The art is consistent throughout. Sometimes it feels as if they drew them all the same day. It was professional. There is nothing unique about the art to make it standout, but it is not bad by any means. They are all of good quality. Halo: The Escalation Library Edition has loads of action scenes, background stories and almost everything diehard fans of the franchise will love. I know it's a cliche, but I highly recommend it.